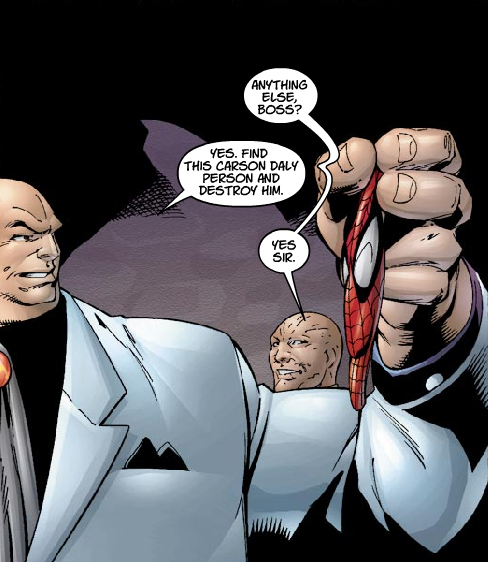 The words “villain” and “supervillain” are commonly misspelled. Don’t mess them up! 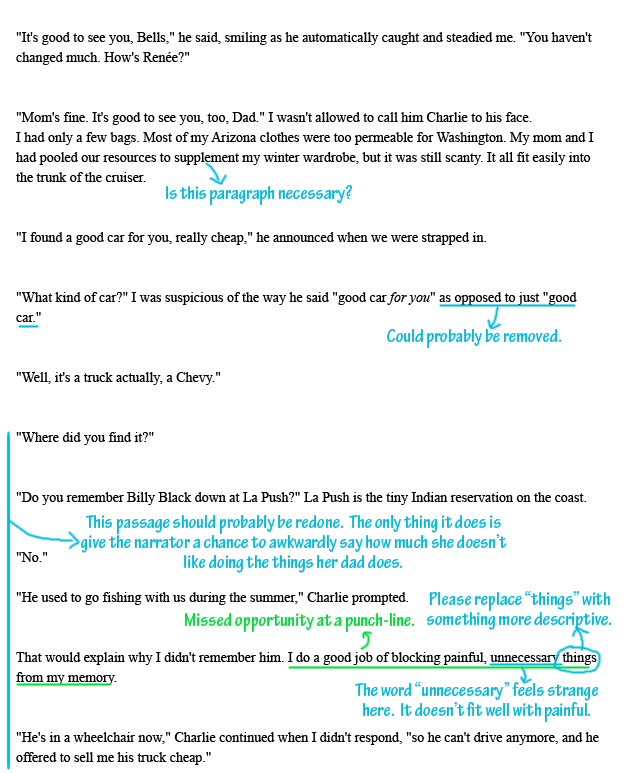 A few weeks ago, I revised the first two pages of Twilight to show how editors rip into even the manuscripts that are good enough to publish. 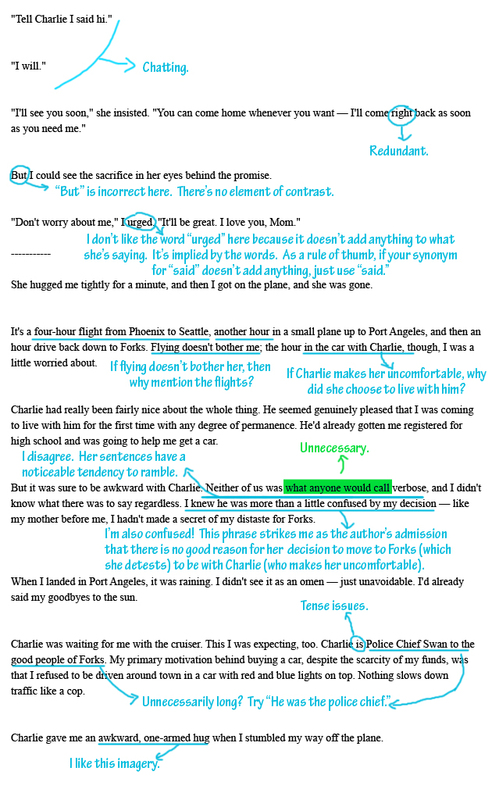 Anyway, I redid the editing so now that will be easier to read. (You can see the original review here, but don’t say I didn’t warn you). I also added the Twilight page to our series of reviews that draw lessons for writers from published works such as Eragon, Soon I Will Be Invincible, and Empire of Ivory. Please Take The Superhero Nation Survey! Hi, I’m looking to get published. My prospective publishers want me to provide information about my audience. Specifically, are you interested in my book about how to write superhero stories? Would you prefer information tailored to novelists, comic book writers or both? I’m very fond of Spiderman Loves Mary Jane, particularly the way it ends its issues. The last page of each issue wraps up the plot of that issue and foreshadows the next issue. The cliffhangers are usually pretty strong and make the reader want to keep going. For example, check out these sample concluding pages. 1. Read broadly and watch a lot of movies. If you’re only acquainted with a few well-known works, your stories will probably feel like they were heavily influenced by those stories. 2. Learn grammar, punctuation and spelling. It’s basic writing craft. THIS IS NOT OPTIONAL. It will be extremely difficult (if not totally impossible) to get professionally published if you don’t have a grasp on these basic writing skills. It’s sort of like showing up for basketball tryouts even though you don’t know how to dribble. You will be the first one cut. If your submission has glaring spelling and punctuation mistakes, you will be the first one cut. 3. Professional publishing is extremely competitive. Most novel publishers, for example, reject more than 99% of their manuscripts. If you’re daunted by rejection, this is not a good field for you. Unless you’re freakishly talented, expect to spend months rewriting before you get published. 4. Try to major in something other than English or creative writing. Having knowledge in a field outside of writing will give you more material to draw on, which will give you an edge over other authors. Even something like history or political science will give you amusing anecdotes you can draw on later. 5. If you’re really serious about becoming a professional author, I’d recommend attending a private university. First, their class sizes tend to be smaller across the board, so writing workshops will probably be more instructive. They also tend to offer more money for undergraduates interested in taking on creative endeavors. 6. Blogging is good experience. It can help you figure out what attracts an audience and what doesn’t. It can also help you create and sharpen ideas. For example, this writing blog has generated at least one book worth of material about how to write well. 7. Writing fan-fiction is generally not good experience. It’s better to try creating your own worlds, characters, plot-lines, etc. The material you generate will be fresher and easier to use later. 8. In writing, there are no points for effort or personal circumstances. You’re judged only on the quality of your product. Please don’t be one of the writers that pleads for the mercy of publishers because they suffer from (usually self-diagnosed) dyslexia or whatever. If something like dyslexia affects your writing, you have three options: overcome the obstacles yourself, have someone else deal with the problem (by proofreading your work, for example), or find a new line of work. Even if you are dyslexic, you will be held to the same standards of readability as everybody else. 9. Writing teachers mean well and can be great sources of advice, but remember to take all advice with a grain of salt. For example, maybe the teacher doesn’t have a style similar to yours. If so, his advice might just mean that he’s not a fan of your preferred kind of writing. For example, we tend to prefer mass-market comedies and action stories rather than denser, literary works. If we told you that your work was overwrought and didn’t move quickly enough, one possibility you should consider is that it’s moving fast enough for the kind of book you’re writing. I’d also recommend looking for literary agents that have experience selling books like yours. Suggestion: if you’re going to advertise a bodycare product, please tell your model to do a pose other than “grimacing in pain.” It looks like she’s taking an acid bath. These are some of the best and worst Marvel panels I’ve noticed over the past week. If you find it tricky to code tables in HTML, I highly recommend Tablemaker. You give it the data you’d like in the table and it gives you the appropriate HTML. Neat. Your table might look something like this break-down of our user statistics for the past year. The second page of Twilight wasn’t as bad as the first, but it still had many problems. This is how I would have edited it. 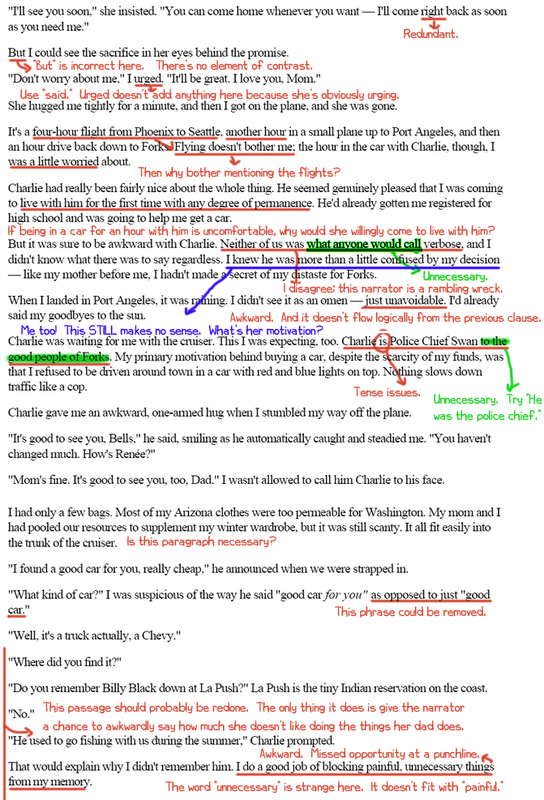 This is how I would have edited the first two pages of Twilight. In particular, I found that the main character has a bland personality and needs better motivations. If I had been the publisher’s assistant considering this work, I would probably have stopped reading at this point. Character motivation is missing. For example, if she loves Arizona and her father makes her uncomfortable, why does she decide to go to Forks? I’m not feeling the main character’s voice. She sounds sort of pretentious (e.g. “despite the scarcity of my funds”) and not terribly interesting. The sentences are unnecessarily convoluted. (Bella really likes em-dashes!) That particularly hampered the pacing during the death scene flash-forward. I don’t think the author is on my page. The narrator says that she’s terrified, but she actually comes across as implausibly calm. * She denies that she’s verbose, but even her denial is verbose! If you want readers to reach those conclusions, have your characters lead the way with their actions and words. Telling us she has a particular trait when she’s demonstrating that she doesn’t is probably not as effective as it could be (unless you consciously want to make the character look unaware of herself). 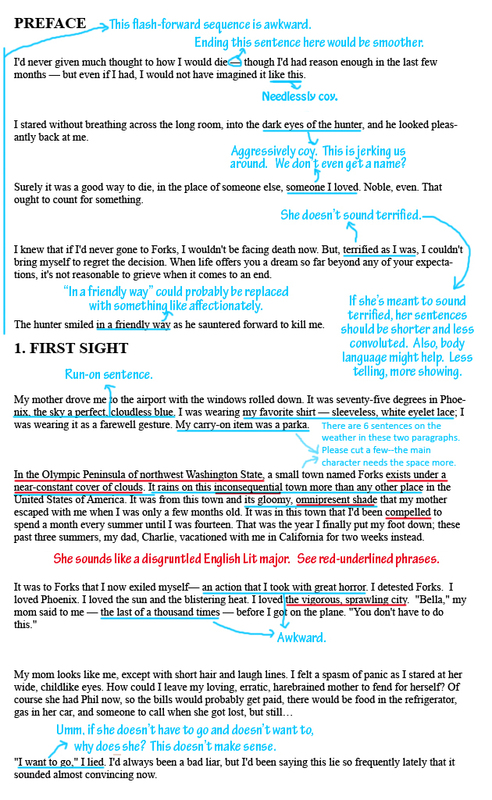 *Across the board, the author could have done more “showing” rather than “telling.” For example, I would have tried to show how terrified the narrator was by using syntax, her word-choice, body-language and actions. Terror is a strong emotion that should be more visible than it was. Although she’s purportedly terrified, she actually comes off as implausibly calm for someone facing death at an early age. It didn’t feel believable to me. If you enjoyed this review of Twilight, please also see my list of editing errors in the Twilight series. It will probably be a few days until I get around to doing regular updates. Care to offer some more stylistic feedback? If you’d like to suggest any, I’d appreciate that. Here are some of the questions we’ve previously answered. How can I beat writer’s block? (Part 2 here). What are some common mistakes on the first page? How can I write an effective opening? What do I need to include in my comic book submission? How can I improve my fight scenes? I’m thinking about self-publishing. What are some of the obstacles I should be aware of? When it comes to developing your characters, be bold. In most cases, it’s safer and more effective to develop character traits clearly rather than take the traits halway. For example, if the hero is definitely smart or cowardly or whatever, readers will definitely be on your page and it will be easier to use the character to drive the plot. In contrast, if the hero is just kind of smart or whatever, it often feels like the author is making it up as he goes along. For example, Dr. Impossible from Soon I Will Be Invincible is kind of the smartest man on Earth, except when he talks like he’s Napoleon Dynamite and inexplicably goes to a funeral attended by hundreds of superheroes. Mohinder is kind of a scientific genius, except when he inexplicably decides to test his mutant serum on himself without doing any sort of testing first. Remove everything from your story you aren’t willing to stand by. For example, if you plan to reveal that the last 10 or 20 pages were just a dream or a hallucination, why bother wasting our time with them? I recommend cutting those pages out, because otherwise readers will probably feel like you’re jerking them around. I also recommend against having lines of dialogue that the character takes back shortly afterward (“when I said something nasty a line ago, I was just kidding! Haha!”) Again, if you aren’t willing to stand by the lines you’ve written, they will probably just confuse and/or annoy the audience. If the character’s not actually nasty, for example, a line that could suggest he’s nasty is probably a red herring that should be removed. Actions should have consequences. One common problem, particularly with Mary Sue characters, is that the character’s actions rarely have negative consequences. Hi, I made this list of questions to help writers get the most out of their review forums. If you have a review forum or would like one, I’d recommend answering as many of these as you can. Just post your answers in a comment and I’ll place that information in your forum. Thanks.